rec. January 2016, Potton Hall, Westleton, Suffolk, England. This is the penultimate volume in a five-disc edition of Brahms’s piano music, and those who have already bought the three previous volumes will need little persuading to add this fourth release in the set to their collections. This programme brings together some of Brahms’s most sublime late piano music with the earlier Ballades, and the spectacular Variations on a Theme by Paganini which is here nicely divided as two bookends to the rest of the works. This is Brahms letting his hair down, with plenty of pianistic bravura and in some aspects delivering some strikingly banal variations, almost making us flinch with their over-the-top melodramas or overt salon-sweet pleasantness. All composers should be allowed a little bad taste from time to time, and even in these cases Brahms is never uninteresting. Jonathan Plowright plays stylishly and with an admirable lightness of touch, controlling subtleties of tone and balance even when Paganini’s 24th Caprice seems well buried under avalanches of octaves. My main reference for this work has of late been Garrick Ohlsson’s fine recording on the Hyperion label (review), which has a bit more oomph in the low register for the recording but still maintains an admirable horizontal momentum. The Hyperion disc doesn’t give track numbers for each variation which is a shame, but even given this I’m pushed to decide on a preference between these two. If anything, Ohlsson keeps my attention a little more, with an added layer of poetic imagery to go along with the apocalyptic pianism, but both are truly excellent. The rest of this programme is more interesting musically as far as I’m concerned. The Ballades Op. 10 are big favourites of course, working well with their restrained and intimate atmosphere as a foil for the Variations. Plowright holds the long crescendo in the first 'Edward' Ballade, pushing into the realms of orchestral weight by the climax while maintaining unforced texture in the sonority of the piano. I like his tasteful way with expression, avoiding rubato that might disturb the flow of the music while maintaining a song-like rise and fall in Ballade No. 2. There is drama at the heart of Ballade No. 3, but this is the fluttering restlessness and quiet chorale-like song at its centre more than the stern defiance of the opening flourishes. The final Ballade No. 4 is a tribute to Robert and Clara Schumann, and the warmth of Brahms' affection for his friends shines through in Plowright's playing - still keeping a respectful distance from overdone histrionics, but letting the notes speak for themselves - at times in all their strangeness - in the best possible way. Perhaps it is the implication in the title, but the two Rhapsodies unlock a freer approach to time from Jonathan Plowright. The Agitato marking of the first is explored in a narrative of bewildering changes, resting for a time in the dancing sunbeams of the softer central section, but reprising that sense of angst once the opening material takes hold once more. The second of Op. 79 goes to even greater extremes, the ritenuto markings taken very seriously by the performer here, driving structural pillars firmly into the ground and building a musical palace with features both strikingly beautiful and darkly sinister. The opening of the first piece in the Op. 119 set has now taken on a post-modern, minimalist character that is only partially dispelled by the Schumann-esque cadences further along. These later pieces are forward-looking in character, heedless of fashion but stoutly refusing to descend into eccentricity and overly tragic emotions in the same period as Erik Satie's Vexations and the same year as Tchaikovsky's Sixth Symphony. Plowright steers us through with a steady hand on the Teutonic tiller, not too extravagantly jocular, not too heavily heroic and certainly not stickily sentimental. Comparisons there are aplenty for all the music here, and I go back to Radu Lupu as often as not when it comes to the Rhapsodies and Piano Pieces Op. 119 (review). Lupu is more Lisztian in the Rhapsodies, getting the plates and cutlery rattling with his forceful and dramatic performances. Lupu's playing is still full of poetry, and if you go in more for extremes then his playing may satisfy more here. The Op. 119 is filled with elegance, but Lupu's restraint is more of the kind which is coiled and ready to release into concert-hall filling sonority at the earliest opportunity - a tension in performance that isn't such a feature of Plowright's readings. Repose means repose in his interpretations, and it is Brahms the composer who sends us moving on, on a fervent search for musical treasures rather than the pianist. Plowright joins us in this voyage of fertile discovery rather than being imperiously above the music and bending it to an equal creative force in performance. There is of course much to be said for both recordings, and there are of course many others in between. 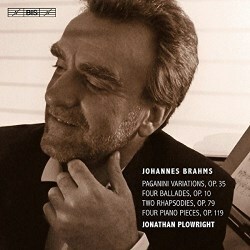 Lupu remains breathtaking, but I'm a huge fan of Jonathan Plowright's Brahms - this release serving to enhance that view.